Leeds goalkeeper Bailey Peacock-Farrell revealed he has turned down overtures from England to pledge his international future to Northern Ireland. The Darlington-born 21-year-old made his international debut for Northern Ireland as a substitute in June’s friendly against Panama. Peacock-Farrell said England have been in touch but he wants to remain ‘loyal’ to manager Michael O’Neill and the country that first gave him his international chance. “I’ve had several chats with the England goalkeeping coaches,” he said. “One rang me the other week in fact, but I’m loyal to Northern Ireland. “They got in really early and made me feel wanted. At the time when I met Michael I was a nobody, I was just a young keeper. “But for him to take that time out of his day to come and chat to me, and tell me about Northern Ireland, the pathway and what we’re planning on doing as a country, for me that was special. Peacock-Farrell qualifies for Northern Ireland through his grandfather Jim Farrell of Enniskillen. He will be watching along with the whole family hoping to see the young goalkeeper make his competitive debut for Northern Ireland in Saturday’s UEFA Nations League opener against Bosnia & Herzegovina - an appearance which would officially close the door on England. “I think my for him and my family as a whole, they will all be overwhelmed and proud to see me playing at international level,” Peacock-Farrell said. Peacock-Farrell’s stock has risen sharply in 2018. 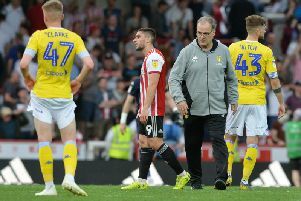 He finished last season as Leeds’ number one and has kept that tag under new manager Marcelo Bielsa as the Yorkshire club made a flying start to the Championship season. The timing seems right for him to now inherit the Northern Ireland gloves from the 34-year-old Michael McGovern, but he is taking nothing for granted as he looks to the long-term. “Michael’s been the number one for a long time now,” Peacock-Farrell said. “To say being number one at Leeds makes me number one here - you can’t really go along those lines.